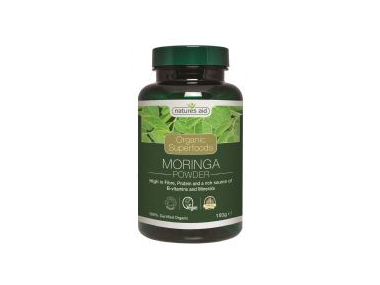 Buy Natures Aid Organic Moringa Powder - 150g in the UK from our online shop or directly from our independent Scottish store. Moringa Oleifera is cultivated from the leaves of the Moringa tree, often refered to as the “miracle tree”, and grows at the foothills of the Himalayas in Northwest India. Moringa is a rich source of B-vitamins and minerals which include; Calcium, Magnesium, Iron, Zinc, Copper, Phosphorus, Potassium and Vitamins; A, C, E, B1, B2, B3. Where can you buy real Moringa Powder Organic safely online? If you are wondering where you can buy Natures Aid Organic Moringa Powder - 150g safely online in the UK, then shop with us. Moringa Powder Organic - Natures Aid Organic Moringa Powder - 150g in Green Foods and Weight Management and Herbal Remedies, Tinctures & Supplements.